FORMATORI : Specialisti in domeniu,experienta in domeniu-peste 15 ani . FINALITATE: CERTIFICAT DE ABSOLVIRE EMIS DE MINISTERUL MUNCII, SOLIDARITĂŢII SOCIALE ŞI FAMILIEI, MINISTERUL EDUCAŢIEI CERCETĂRII ŞI TINERETULUI CU RECUNOAŞTERE NATIONALA ŞI INTERNATIONALĂ. TITLUL OBŢINUT: INSPECTOR ( REFERENT) RESURSE UMANE,COD COR 333304. -TIMPUL DE MUNCA.TIMPUL DE ODIHNA.CONCEDIILE.REPAUSURI PERIODICE. -CONTRACTE COLECTIVE DE MUNCA.CONFLICTE DE MUNCA.DIALOG SOCIAL. -INTOCMIREA STATULUI DE PLATA PENTRU PERSONALUL INCADRAT. -INTOCMIREA SI TRANSMITEREA DECLARATIILOR LA BUGETUL DE STAT. -CONTINUTUL DOSARULUI DE PENSIONARE.TERMENE DE DEPUNERE. -UPGRADE DE CUNOSTINTE PENTRU PRACTICIENII IN DOMENIUL RESURSELOR UMANE. 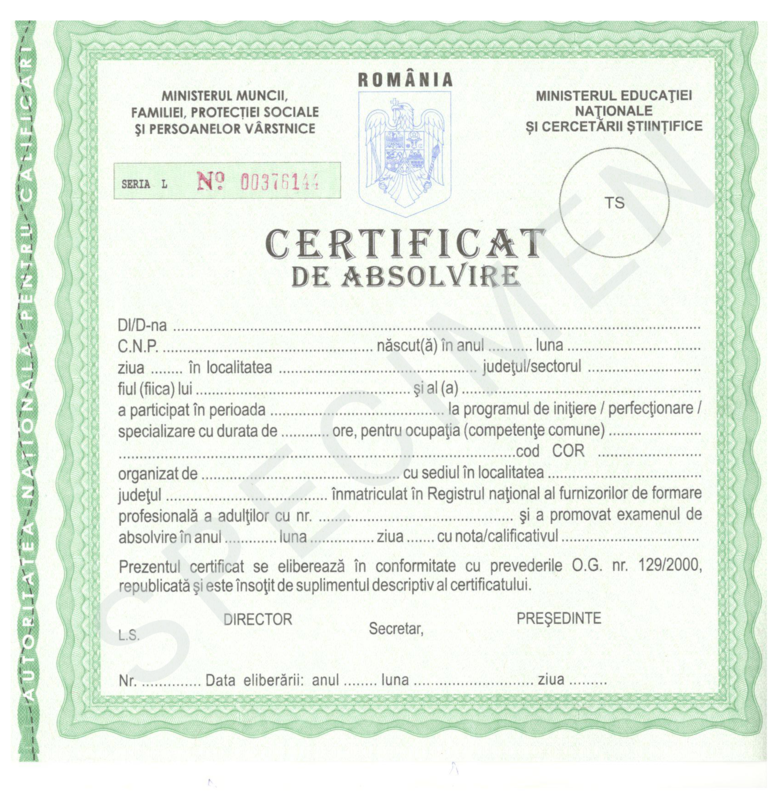 -SUPLIMENT DESCRIPTIV AL CERTIFICATULUI CE CUPRINDE COMPETENTELE DOBANDITE LA CURS.